How do I create a UTM report in Salesforce? 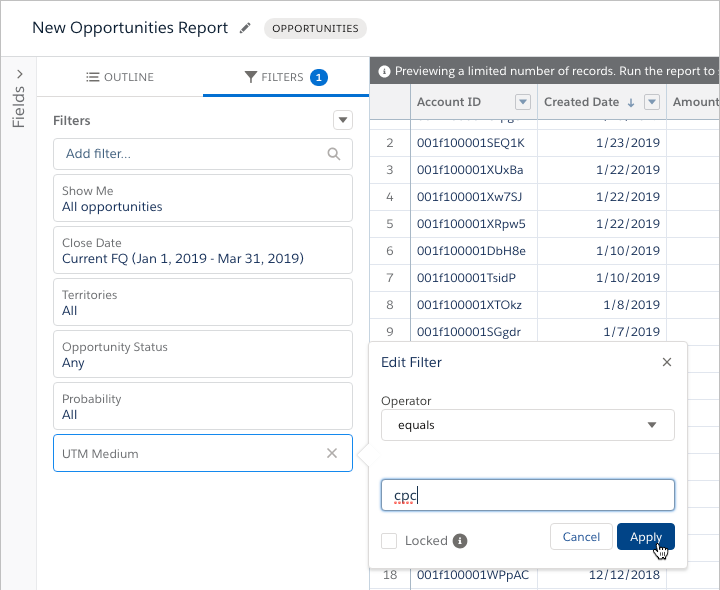 Before you get started with AdStage Join for Salesforce, you'll need to create a report in Salesforce that includes the CRM data you want to join with your paid marketing data. AdStage will use the contents of this report to complete the Join task you create. We recommend allowing some time to plan exactly what data you want in these reports, and therefore in your AdStage Join custom conversions. How do I set up my report? Step 1: Login to salesforce.com and go to Reports. Step 5: Click Save and name your report in the pop-up modal. You're almost done! Step 6: Navigate back to the Reports home screen. Step 7: Subscribe to the report by clicking the down arrow in-line with your new report. Step 8: Select Daily in the Subscribe pop-up modal. If you're not sure of exactly which columns you'll end up actually using in your report, it's a good idea to include more than you think you'll need. Always make sure the "Created Date" column is in descending order before saving your report. Make sure the date range is set to include future leads/opportunities. The default is Current FQ, which works great. If you don't already track UTMs in SFDC, check out this article from GA Connector to learn how. Have questions about building reports in SFDC for AdStage Join? Reach out to us at support@adstage.io.